In 1950-51 there was a new generation of bluesmen whose evolving music synthesized the raw power of the Delta blues, the amplified energy of electric instruments and the bold tempo of the ghetto streets. Little Walter was just 19 years old, Baby Face was 26 and Muddy Waters was 34. The Parkway session presented here failed to produce any chart records, but did generate a wild, romping collection of down-home blues that has achieved legendary status through various issues and reissues. 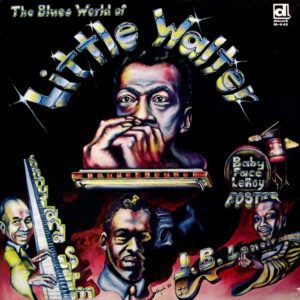 Of course Little Walter would soon emerge as the world’s premier harmonicist and scale the heights of blues stardom. He will be remembered as a true blues genius in the same category as Muddy Waters, Howlin’ Wolf and very few others. Amazingly, The Blues World Of Little Walter is the first time all eight sides have been issued together as well as the first time they’ve been released utilizing the original masters as the source material, now digitally restored.